The Ministry of Women and Child Development, Govt. 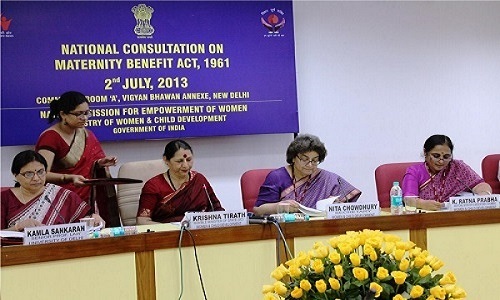 of India, organised a day long consultation on the Maternity Benefit Act, 1961 on Tuesday, 2nd July, 2013. The National Mission for Empowerment of Women, on behalf of the Ministry of Women and Child Development, coordinated this consultation in the Committee Room ‘A’, Vigyan Bhawan Annexe, New Delhi. The Inaugural Address was delivered by Smt. Krishna Tirath, Hon’ble Minister, Women & Child Development. It was attended by many senior officials of the Ministry, Planning Commission, State Governments, UN Women, ILO, representatives of many prominent civil society organizations, experts and academics. Maternity protection is an essential pre-requisite for women’s rights to gender equality with regard to their work and profession. The right to maternity protection is enshrined in the International Human Rights Instruments, International Labour Conventions, in the Constitution of India and implemented thought the Maternity Benefits Act, 1961. This day long consultation will deliberate on the following pertinent issues implementation and operationalisation of this Act in all States.  The growing proportion of informal workers employed by this sector—directly recruited subsidiary (temporary) regular and casual workers and those employed through sub- contracting, outsourcing and so on –- are not covered.  The ESI Act covers only those earning less than Rs. 15000 per month. Although workers earning more than Rs. 15000 per month in establishments covered by the ESI Act are in principle, eligible for coverage under MB Act they are rarely covered in practice.  The eligibility of a sector or class of establishments under the purview of the MB Acts (except those specifically mentioned in the Act) is for all practical purposes determined by state governments and is variable across states, as is geographical coverage. State governments have also been vested with the power to exempt any sector or class of establishments. There is thus a great deal of confusion and lack of uniformity as to the sections of workers to which the current maternity benefit legislations apply. Coverage is partial, and fragmented. Whether an eligible woman gets maternity cover depends on where she lives—rural or urban as well as the state.  Implementation is poor. According to the NSSO (61st Round) only 0.30 per cent of female workers over 15–49 years have access to health care and maternity benefits. Those who are not eligible by this estimate account for 99.7 per cent of the workforce, that is, 102 million.  The MB Act glosses over the discrimination which pregnant women face at the time of recruitment and widely prevailing practice of dismissal if a woman employee is pregnant. It is usual that the application of a worker for paid maternity leave is answered by employers with termination notices.  The period of maternity leave is only 84 days, while the recommendation for exclusive breast-feeding is 6 months by WHO (World Health Organisation). Many invaluable recommendations emerged from this consultation to enhance the scope and better implementation of this important Act. The recommendations will be put together by a core group of Experts formed during the Consultation in order to pave the way forward. AskAmma looks forward to the recommendations, particularly to increase maternity leave to be consistent with the WHO Guidelines, to see that all women get Maternity benefits, and to fight discrimination against women in the workplace.